360 is a buzzword, a slogan, a term that is used to promote everything from burritos to Anderson Cooper, but 360 photography is enabling us to explore new environments and interact with products as we’ve always been hardwired to do. From birth we’ve naturally learned our surroundings, and objects within it, using 360° views, but legacy print media, and its limited requirements, have trained us to comprehend and expect flat, two-dimensional views. The rapid adoption and inclusion of high-resolution cameras in all aspects of our lives—drones, smartphones, cars, even ski goggles—take the wonders of 360° technology to new heights and transform our once limited expectations. Creatively combining hardware and software has resulted in visual experiences that rival reality. Visiting a foreign land or touring a historic building is an easy win for interactive 360° experiences. Imagine walking through Buckingham Palace or climbing to the top of Mt. Everest. You can go place you’ve never been or never dreamed of going. Websites such as AirPano.com are dedicated to the creation and collection of interactive 360° panoramic photographs of the most beautiful cities in the world. AirPano states on its website: Unlike viewing a traditional photograph limited by its frame, or watching a film that follows its director’s idea, a spherical panorama gives you a freedom of being on location, where you can turn around 360° and have a closer look at every detail. Have you ever wanted to swim with great white sharks or mountain bike down the side of a mountain? Whatever your level of danger, imaging technologies give viewers a first-hand experience without the threat of injury. GoPro has historically cornered the extreme market, but new players are starting to emerge. 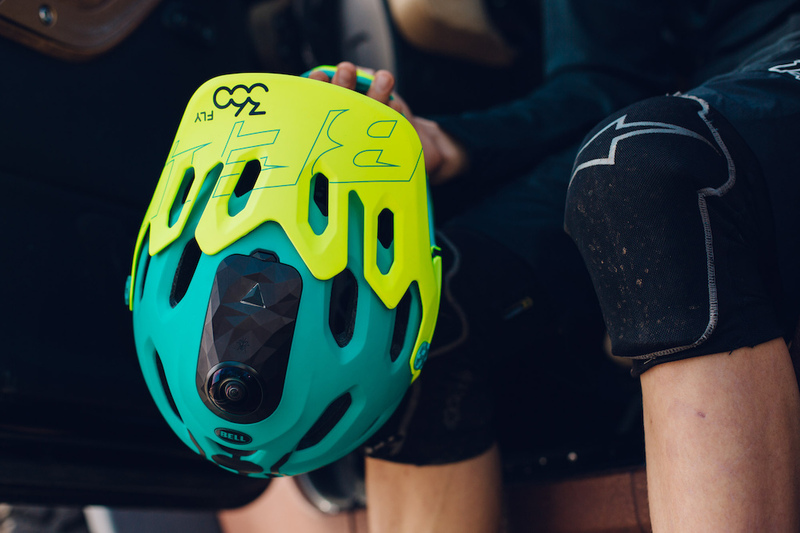 Giro and Bell, two BRG Sports brands, are looking to embed “all seeing” 360fly cameras into their sports helmets—making heroic leaps and disastrous falls all the more epic. Peter Adderton, 360fly CEO, said to PinkBike.com: From day one, our focus has extended beyond the baseline benefits of immersive 360-degree VR content, and into the expansive universe of intuitive “smart” technologies that our single lens technology enables. For most beautifully complex sculptures and artworks, a single perspective hardly does justice to the intricate narrative told from each angle. The intention of the artist is rarely to have an observer see the work from a single viewpoint, but to experience it in the round. The Metropolitan Museum of Art (Met) is profoundly changing the way we view, study and experience 3D sculptures and artwork through a photographic project dubbed “360° Spin.” The project uses technology devised for commercial advertising to capture three-dimensional artworks in 360° spin. Barbara Bridgers, General Manager for Imagining and Photography in the Met’s Photograph Studio, noted: There was an increased desire to include images on our website and on portable devices that present objects from a variety of angles, and this technology allows us to enhance the experience of seeing a three-dimensional artwork… and when you see the sculpture in 360 degrees, it comes to life in an exciting way. 360° imaging gives the construction industry new and enhanced ways to document progress, communicate project scale to stakeholders, and approve stages from off-site locations. It not only tells the story of the finished project, but the time that went into building it. At 80% complete, the Minnesota Vikings decided to document the interior of U.S. Bank’s Stadium from the highest vantage points. The interactive panoramic imagery gives fans a sneak-peak of the new architectural features and an appreciation of the 7,500 construction workers who have contributed to the project. As tech-savvy shoppers increasingly want a visually engaging, convenient, and comprehensive e-commerce experience, online retailers turn to 360° imagery to meet these evolving expectations. 360° spin imagery, interactive product photography that allows online customers to virtually spin a product to view it from every angle, delivers the next best thing to an in-store experience. Customers are able to answer their product questions on their own and feel more confident about their purchase decisions because they saw a more complete product view. According to eBags, an online retailer of handbags, luggage, backpacks, and laptop bags: 360° & 3D spins help us convert engaged customers by giving them a comprehensive visual understanding of the product. It helps them buy more confidently. Once customers are engaged in a spin image, they are 3x more likely to convert. The world is a big round place and it’s about time we took notice. Whether for business or for entertainment, companies like GoPro, LG, Samsung, Google, Nikon, and Canon are investing heavily in expanding 360-degree capabilities. As web interfaces and mobile capabilities rapidly advance to meet our demand for visual content, I expect to see some pretty amazing things in the near future.